In late June of 1994, the Sesuit Tennis Center on Cape Cod looked like 1974. White shirts, white shorts, short white tennis dresses adorned the green hard courts. White caps and floppy white “Aussie” hats, too. White tennis balls. And, most striking of all, looking so thin and frail hanging from the arms of the players, wooden rackets: Dunlop Maxply Fort, Wilson Jack Kramer, Chris Evert Autograph. Looking around as I walked to the baseline to serve, I felt as if I were back at Kendalltown tennis club in suburban Miami, twenty years earlier. Missing only was the popular Wilson T2000—metal sceptre of the brat king, Jimmy Connors. For this was the First Annual Woody Tournament of Cape Cod, the local exemplar of a phenomenon appearing recently at clubs around the country. No steel, aluminum, graphite, titanium, or composite need apply. If it didn’t come from a tree, leave it at home. To some, the premise of the tournament may have been a novelty; my first-round opponent had never even played with wood before. To others it was merely a resurfacing of a quaint memory—”Can you believe we actually played with these things?” But to me—and to many others, as I was soon to discover—it was something much more. In the week before the tournament, as I practiced with my old Kramers (last used in 1982, my first year of college tennis), I was visited by a long-forgotten pleasure: the feel of wood. Sure, it was harder to find the sweet spot of the smaller head, and even when you did there was none of the space-age power of today’s launchpads. It required a lot more skill to hit any particular shot; at the net you had to really volley, with correct half-swing form, not just stick out your shield and watch the ball richochet off for a winner. Fundamental technique, remembered deep in the muscles, became critical again. The game was also more fun. In the early 1970s, when racket manufacturers were experimenting with new metal designs, the bread-and-butter advertising campaign bragged of “the power of metal, with the feel of wood.” Every kid learning the game came quickly to know that steel was for power and wood for control, just as a flexible frame was for power and stiffness for control. The consensus, though, was that the power you got with metal was not enough to make up for the loss of feel. Connors swore by his T2000 (customized with lead tape to dampen the whippiness), but for the most part wood held its ground. In 1980, the International Tennis Federation had convened to discuss their options regarding oversized rackets and “spaghetti strings,” another 1970s innovation, in which the strings were kept loose and wrapped with coils to produce unprecedented spin on the ball. The ITF passed tennis’s first official specifications for rackets and strings, outlawing spaghetti strings but allowing oversize rackets to survive. The situation worsened in 1987, with the introduction of widebody rackets that made the normal oversize rackets look like wood in comparison. And now we have monstrosities like the new Prince Vortex, that uses “a graphite-fiber-reinforced thermoplastic viscoelastic polymer” to create variable flexibility. Fifteen years after the ITF’s anemic regulations, most tennis aficionados lament the state of the professional game (particularly the men’s), in which a typical point consists of an ace, or perhaps one or two cannonball shots after the serve. The power that professionals can summon from state-of-the-art rackets is simply too much for the delicate, touch game of yore to survive. Players like Goran Ivanesevich, with a massive serve and not much more (by professional standards), can reach the finals of Wimbledon. Revisionist proposals for improving the game have surfaced from time to time: Make the balls heavier; make the court larger; take away the second serve. But this is like curing halitosis by distributing noseplugs. Is the solution too simple to see? Bring back wood. Major League Baseball requires wood bats for the same reason—so that average players don’t start hitting 100 homers a season, and 12-10 doesn’t become a routine score. But in tennis, the racket companies are making too much money to let that happen (in 1975 the Dunlop Maxply—as good a wood racket as existed—cost $25; by 1980 you had to spend at least $100 for a decent oversized racket; and now many popular models are over $150). If the players and fans had made a stand in 1980, they could have convinced the ITF to require conventional equipment for the pros, as in baseball. In reality, they could do it now, without impinging on the racket companies’ wealth, since amateurs could still buy big rackets, just as softball players and amateur baseball players (even in the NCAA) use aluminum bats. But the inertia of 15 years of big-head professional tennis will be difficult to overcome. We may have lost our chance by 1982. My brother and I were among the last defenders of the wood. As college teammates—his senior year, 1982, was my freshman year—we stood alone with our toothpicks against an approaching army of oversized technological wonders. Through the regular season, Ron, with his enviable speed and touch, managed to remain undefeated at the number one position, against a barrage of scientifically enhanced cannonball serves. At the Division 3 national championships in Kalamazoo, he was virtually the only player in the 64-man draw using a conventional racket. He remembers it as an immense psychological (not to mention physical) disadvantage, like fighting against rifles with bows and arrows. In the first round, he lost a close match to the number two seed. That fall, I showed up at school with two new midsized aluminum Yonex R-1’s. Having to compete against the new rackets, I decided there was no point in clinging to wood—it just made me feel weak and small. But at the Woody tournament last year, I saw all over again how the ineluctable march of technology had degraded tennis. It’s a better sport with wood. In April of 1991, Bjorn Borg reappeared on the professional tennis circuit after a mysterious nine-year absence. Mysterious because at the time he retired at the end of 1981 he was 26 years old, in as good physical shape as a human can be in, and had won five of the last six Wimbledons, not to mention the past four French Opens. Borg had said he was simply sick of tennis. But perhaps he was also sick of what he saw tennis becoming. Although he and McEnroe fought their historic battles with wood in their hands, big-head Huns were visible on the horizon. How were these aging touch-and-speed players supposed to hold their ground? Sure enough, by 1983 McEnroe was wielding a midsize graphite Dunlop. 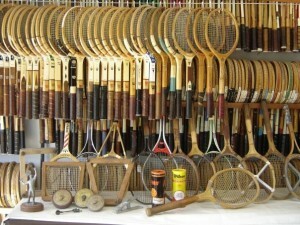 Connors was still standing by his stash of old T2000s, but after that year he would never win another major tournament. And Borg was gone with the wood. When he resurfaced after ten years, he looked like one of King Arthur’s knights on a Connecticut Yankee’s backyard court. Young powerful palladins battled each other on the red clay of Monte Carlo, blasting serves with the latest generation of oversized, widebody rackets. And there was Borg, stepping onto the clay, pigeon-toed as ever, dangling from his right hand a black wooden anachronism, custom-made by Gray’s of Cambridge to replicate his old Donnay model. He never had a chance. Although he was still in pristine‘ physical condition, his shots looked ludicrously soft, floating lazily across the net before taking a beating from Jordi Arrese’s oversized racket. Six-two, six-three, and the comeback was over for now. Borg quietly cancelled his plans to enter the French Open. The next summer he was back, resigned to the times, swinging a bright-orange big-head racket. At the U.S. Pro Championships, a nontour event at the Longwood Cricket Club near Boston, he strode to the court through a tunnel of admirers befitting a rock star, his sharp Viking features humbly tilted to the ground. And he almost pulled it off, winning his first match before losing in the quarterfinals to Alexander Volkov, the twenty-second-ranked ranked player in the world, 7-5 in the deciding third set. It would be his last gasp. A few months later the comeback was over for good, and Borg moved to the Master’s circuit with his old nemesis Connors, who now also sported a flashy new oversized racket. After playing in the Cape Cod tournament I became obsessed with wood rackets. I had feverish dreams: wandering through sporting-goods stores, finding Maxplys and Kramers on the racks selling for thousands of dollars. Or playing matches with wood rackets that fell into pieces as I hit the ball. I dreamed of wood rackets the way others dream of childhood: as belonging to a better, more innocent world, a paradise lost. I set out on a mission, to acquire at least one Dunlop Maxply in playing condition. Although my Jack Kramer was certainly a classic model, the Maxply was my idea of the consummate wood racket. Of medium stiffness, it was just right for a balanced mixture of serve-and-volley and baseline play. And its Spartan design emphasized its sylvan origin: it really looked like a piece of wood. Introduced in 1931, by the 1960s and early 1970s it had become the most popular racket in the world, and it still brought to my mind images of the great players who had used it, from Lew Hoad to Rod Laver to McEnroe. But where would I find one? All summer I scoured tag sales in vain. Surely, there had to be some wood rackets in a basement somewhere waiting to be exhumed and sold off with the LP’s, eight-tracks, and typewriters. The closest I came to success, however, was at the local public courts, where I spotted a ten-year-old boy knocking a ball against the battered backboard with an actual Dunlop Maxply, circa 1976. As the boy and his father walked off the court, I approached and asked if they were interested in selling the relic. But I must have betrayed my zeal, for the father’s eyes lit up: “This baby?” he said. “Sorry, I love these old rackets.” He probably thought from my enthusiasm that he had a collector’s item on his hands. But as far as I knew, I was the only market for old Maxplys, and I had only a few dollars to offer. As it turned out, though, I was not alone. I began to hear about other woody tournaments around the country. “They’re cropping up everywhere,” a Dunlop product manager told me. The Waltham Racket Club, an indoor club outside Boston, had had one the previous winter. A Dunlop sales rep I contacted had played in one in Maine the previous summer. An invitation-only tournament took place in Los Angeles in the fall. And then, this March, I received a faxed announcement with the automated sender information: “From: WOODY H.Q. Wood is Good!” A drawing underneath depicted a 1920s tennis player in long white pants. The ornate announcement made my mouth water. “The Woody Tennis Championships,” it read. “A Gentlemen’s Grass Court Event.” Grass courts!—the one ingredient missing from the Cape Cod tournament. What wood is to graphite, grass is to asphalt. One is natural, bucolic, reminiscent of the game’s origins on lush country lawns; the other is synthetic, modern, with the ambiance of a strip mall. And although the play at Wimbledon (the only major tournament still played on grass) might suggest that grass exacerbates the problems with today’s game—power shots skid away even faster, lessening the potential for long rallies—it is the perfect surface for wood-racket tennis. One needn’t hit the serve 120 mph to have a chance; the quickness of grass allows a well-placed serve to set up a winning volley. Yet the pace remains slow enough with wood so that one needs, and has a chance to use, every shot in the book. The chip return, the slice approach shot, the defensive underspin lob, all find their strategic moment. And the feel of grass underfoot complements the feel of wood in the hand: these are the conditions for which the game was designed. Although I grew up playing mainly on hard‘ courts, tennis with big rackets on asphalt sometimes seems as much an abomination as baseball indoors on AstroTurf. This attitude is not just nostalgia. You’ll never find a downhill race restricted to wooden skis, or a rage for tackle football played with leather helmets and no facemasks. Woody tournaments are burgeoning because of a growing conviction that tennis is a better sport when played with conventional rackets. Recently, influential tennis personalities such as Bud Collins and Martina Navratilova (finally) have urged the ITF to consider returning to wood. “The sport has no pizazz,” says Bob Carr, publisher of the trade magazine Inside Sporting Goods. “The business peaked in the 70s and died.” Indeed, tennis equipment sales have plummeted in the‘ 1990s, viscoelastic polymers notwithstanding. If the racket companies look back to the great tennis boom of the early 1970s, when the wood racket reigned, and if woody tournaments continue to spread, then who knows? Such hopeful visions resurfaced as I gazed at the grass courts of the PGA West Tennis Club, in La Quinta, California. Four rectangles of chalk embroidered a level green basin carved out of an elegant lawn and framed by a 180-degree vista of snow-peaked desert mountains. In my bag rested two aged Maxplys, rescued from Boston thrift shops. Granville Swope, the man behind the Woody H.Q. fax and a codirector of the Woody Tennis Championships, had invited me to come out and play in the tournament. I could hardly decline. Since the age of ten I’ve dreamed of playing on grass, and in these dreams, even in recent years, the rackets have always been made of wood. The reality was no disappointment. The grass, fastidiously manicured for the pleasure of the wealthy, played true. My painful shin splints dissolved on the soft putting-green surface. An impressive gathering of players—teaching pros, former Division 1 college players, some veterans of pro tournaments—knocked around white balls with the wood rackets they’d grown up with, showing little difficulty in the transition. Although some players still served at speeds over 100 mph, most serves were returnable, and long rallies were common. Touch volleys won out where brutal overhead smashes, deadened by the grass, were often lobbed back with ease. On the day of the finals (which I was not in) I practiced on a back court in bare feet. I was running along a field with a stick in my hand, chasing a flash of white. These days, when I do play tennis, it’s almost always with one friend or another who far less experience than I have on a tennis court, and I use a wood Maxply. At that level wood isn’t even a disadvantage—I wouldn’t want to utilize the full power of a big racket anyway. We’re playing just for fun, and it’s more fun with the wood: I can feel the ball in my muscles as I hit, and place it instead of pulverizing it. When I do play a competitive match, I resort to my modern oversized racket—the joy of wood is lost when you spend the whole match fighting uphill against superior power. The most fun, however, is when my brother and I find time to go to the deserted public clay courts we discovered out in the country. We bring our wood rackets. Long baseline rallies, carefully planned approach shots, and volleys that need to be crisp and angled to win the point: we can almost imagine that big-head rackets went the way of spaghetti strings, and that tennis is still the game it should be.